With good weather, beautiful nature and plenty of shorelines, Lanzarote / Marina Rubicon ranges amongst the most sought-after destinations visited by many sailors every year. Its popularity is due to the fact that sailing is a national pastime here and there are plenty of great offers for yacht charter to be found. You can easily find charter yachts in Lanzarote / Marina Rubicon on YachtBooker by checking the YachtFinder® menu located on top of this page. When you’re looking for a boat, just click on the search criteria displayed in the box and enter your preferences. You can specify criteria like the country of destination, the type of yacht as well as the duration and departure date of your sailing holiday. The results displayed are all from the extensive YachtBooker database that comprises about 4,500 sailing and motor yachts. 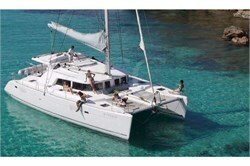 The right side of the page contains a list of articles about locations that can be found in Lanzarote / Marina Rubicon. They are all touristic resorts and well suited for receiving charter guests. In the articles you’ll find comprehensive information on basic sailing related topics such as local winds and weather, provisioning, eating out and sightseeing.